This morning’s yoga is focused on lengthening our bodies and being aware of our posture which is necessary for our first trail ride later in the day. After breakfast of scrambled eggs, french toast, and awesome Costa Rican coffee, we go through a another mandala focusing on a chart of emotions and what those emotions represent; then how to handle them (for instance vulnerability is the feeling that something significant is about to change or be revealed so the question you might ask yourself is what belief, or perception or physical safety is about to be challenged and how can you accept this new insight because if you don’t, the feelings may intensify to rage or panic). I have no idea at the time but I am about to experience vulnerability for real later in the evening. Later in the day we gather our gear for our first ride – I’m finally going to get in the saddle. The vulnerability for me is that I don’t have riding skills although the majority of the group does. The workshop is not about learning to ride as much as it’s about reading the horse, learning their language, creating a relationship and figuring out our own minds, intentions and consequences. All 12 of us plus our leadership group head out of the barn and down the road to a trail that is often ridden by the horses and that they know well. We are going to ride to a waterfall, go swimming and ride back. Sounded simple enough. The foreboding was in the phrase “bring your flashlights” but I just figured this was “just in case” something happened and always be prepared. As we start down the road to the trail, I’m apprehensive because I don’t have riding skills so I’m trying to think of all the things I have ever been taught in the few lessons I’ve had years back – be present, look ahead, control the reigns, sit up straight, breath. I try to relax and keep blowing air out telling the horse I’m not anxious but as we’ve been learning, I can’t hide emotions from the horse. Debbie instructs me to just tell Suzy that I’m scared and ask her, either out loud or silently, to take care of me and that I will trust her. Thank God she is an older mature horse (20ish) with an old soul that knows her stuff. A note I want to make before I forget is that one of the remarkable things about Leaves and Lizards is that, through natural horsemanship, the horses do bot have bits – only bridles. Our Eponoquest leader, Shelley, explains that with pain as the constant consequence, the horses never get a “say” and if you don’t listen to your horse, you will have a relationship of struggle. As we progress through the trail, I realize the terrain is not going to be flat…AT ALL! Not sure why I thought terrain in Costa Rica would be flat (duh) but as we go down hills that are deep mud and the mud is of course slippery, I am more scared than I can put words to. Vulnerability starts to head toward fear and panic. Everyone is doing their best to convince me that the horses are sure-footed, they won’t fall and so on but I’m not convinced AT ALL! Just like I’m not convinced when flying that there are so few plane incidents that I shouldn’t worry because statistics say we are very safe to fly. Right. I battle the fear, try to breathe out deep breaths and plead with Suzy mentally to keep me safe. We pass some other horses and I’m all tensed up worrying about the antics between the horses which I’ve already witnessed with some of the others..little nippy bites and even kicks. 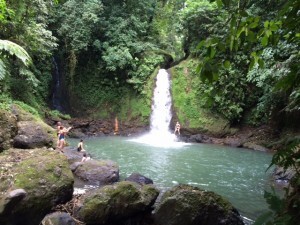 We finally arrive at the waterfall and I am more than happy to get off my horse and try to relax my body. 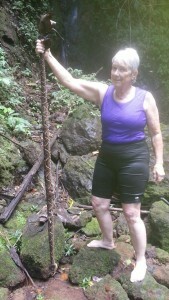 As we hike to the waterfall, we hear a story about another group that came to the waterfall and a fer de lance (very large snake…see pic) came over the waterfall and landed in the pool of water where everyone was swimming. After some screams of “everyone get out” the snake was killed. Barb, a veterinarian from Arizona who is sharing this oh-so-lovely story, brings out her phone to show us the dead snake. I make a Note To Self: DO NOT go swimming. Half the group swims and the other half just hangs out. After Barb’s picture, it’s not hard to figure out which group I’m in. It’s now about 4:30 or so with only an hour left of daylight. I’m getting antsy to go. I’m nearly the first one back to the horses who’ve been turned loose in the field and we are told to catch them using our newfound “join up” skills. I fail miserably. Suzy is enjoying eating the grass and is having none of that bridle. I enlist help, feeling like a failure but I really don’t care at this moment because I want to get home before dark. The trail nearly sent me into a panic during the day so a night ride would land me in an institution. Finally I think we are about to go and Debbie announces we doing another miindala. What??!!! I’m pissed. I want to GO HOME!!! I don’t work very hard at hiding my anger but I don’t throw a fit either. As we work through the mindala, it becomes apparent to many of us that we’ve been set up…the intention all along was to make use ride back on this treacherous trail in the pitch black of the Costa Rican forest where there is no light on a trail that is very difficult. I see now why vulnerability, if not addressed, can lead to rage because I’m sitting right at rage’s door about now. The tension in the group is palpable and Debbie admits that the plan was to go back in the dark and tries to talk us through the feelings of vulnerability and how we also experience this in our lives and how scary is to reach down inside and trust…just give in to trust. It’s dusk, we mount our horses and head back. 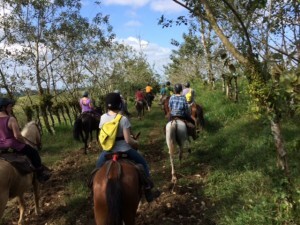 We are going up steep hillsides, coming down in mud, crossing a small river bed (where the horses like to lay down unless you have the leadership skills to not let them…just a little more pressure to add to the situation!). I can’t even begin to write about my emotions and fear. I’m feeling panic but constantly trying to talk myself down from that edge; it’s exhausting and goes on for an hour. There are parts of the trail that are flat as we cross some pastures and those moments were truly beautiful. The lightening bugs were out (we never see those at home anymore! ), the sounds of all the animals in the forest/countryside was eerie but peaceful, and there was a sense of nature and calm that is indescribable – if only we could stay on flat land. 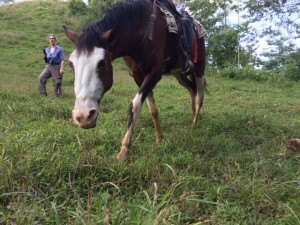 Let me take this opportunity to say I have no photos from this trail ride – my focus was on staying alive. But we can’t. Panic comes right back as we approach a steep hill of deep mud leading to another river crossing and the darkness is thick and my only thankful thought is that I got one of the two white horses giving off just a bit of light. I had forgotten how dark “dark” is in the country with no lights from houses. There is also barbed wire on either side of the trail that I can’t see. I pull out my itty bitty flashlight which doesn’t do much good but it gives me a momentary release from the terror in my chest that I can’t see what’s ahead and I can’t fathom how my horse can either. After what seemed like an eternal time in panic mode, we make it home alive. I’m so pissed I just head back to my cabin and practically tear off the cork of a bottle of wine with my teeth. Why would a beginner like me be subjected to what I see as a dangerous situation and be pushed to that level of fear? To learn to trust of course. Ok, I get it. I need to trust Suzy implicitly for the remainder of the week while simultaneously making sure that I don’t let her take advantage of me at times when I need to show leadership because if I can’t be the leader when needed, then what good am I to the herd?